Thank you to all who participated in this year’s Chiropractic Day on the Hill! 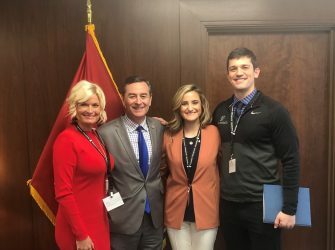 From Maynardville to Memphis, Portland to Athens, and everywhere in between – chiropractic physicians, assistants, family members and patients showed the strength of chiropractic in action at the State Capitol! Joining together, they brought a unified message on issues impacting the profession and the health of all Tennesseans. 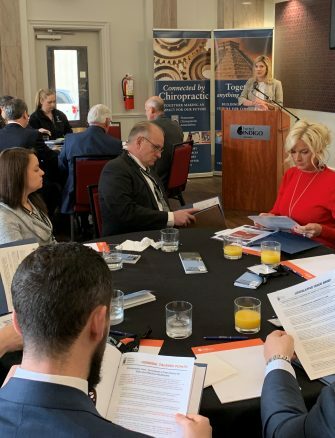 As a result of their efforts, there were more than 44 connections made with state lawmakers who will vote on chiropractic issues! Their presence is a testament to the dedication and passion that is alive within our profession across the state. TCA Government Relations Chair and Past President Dr. Andrew Dixon and TCA E.D. Tiffany Stevens led the morning briefing at the Hotel Indigo where attendees received their materials and enjoyed a light breakfast. TCA Lobbyist John Williams provided additional information on this year’s chiropractic agenda items to assist constituents in preparing for their meetings that day. Additionally, TCA Lobbyist Alexanderia Honeycutt Gambrell was onsite at the Cordell Hull Building to support advocates in their appointments. 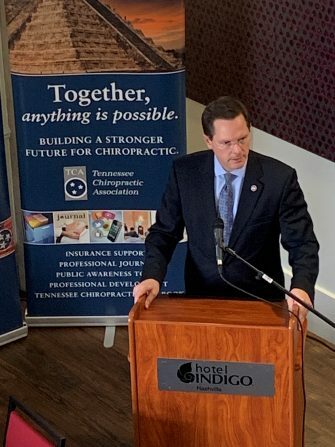 TCA President Dr. R.J. Crawford led the Legislative Luncheon providing updates on TCA advocacy efforts and highlighting the need for TCA PAC Fund support for furthering pro-chiropractic initiatives. Sincere appreciation goes to Chairman Cameron Sexton who took time to come and speak to participants on issues affecting the profession, including ways that chiropractic can benefit our state’s health care system. Thanks also to Carol Lovin, chiropractic advocate and wife of TCA Member Dr. John Lovin, for sharing her inspiring story of how she was led to be more involved in advocating for the profession, which grew to her taking part in successful local political campaigns and fostering key connections at the state and national levels for chiropractic. 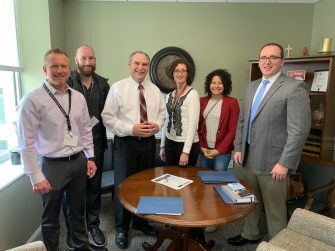 Once again, meetings and office visits with local legislators were a prime focus of the day providing valuable feedback on our bills and other matters. Professional issue briefs highlighting key bills, including our Alternatives to Opioids Bill, were provided for participants to use in their legislative appointments. These briefs are also available under “Advocacy” on the TCA Members Only website for those who would like to provide materials to their legislators. Many members of TCA legislative leadership team went above and beyond to assist others in their appointments and foster key connections, including our TCA Board of Directors, TCA Past Presidents Dr. Shannon Bone, Dr. Cole Hosenfeld, Dr. Beth Barnett, Dr. Michael Massey, Dr. Art Lensgraf, Dr. Lou Obersteadt and Dr. Barry Cole and so many more. We are sincerely grateful for the willingness to step in wherever needed to make sure all had a positive experience! A first in our Day on the Hill history, the TCA had two pro-active bills on calendar in their respective committees. 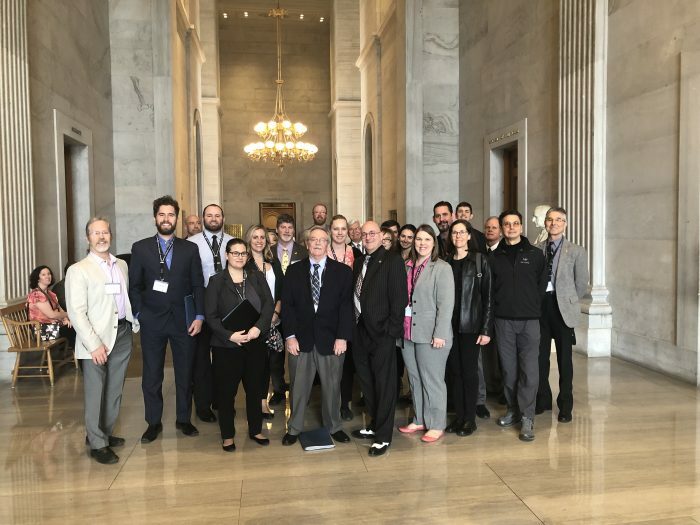 This created a unique opportunity for participants to experience first-hand the importance of communicating with these lawmakers and the impact of the legislative process on chiropractic issues. The first of the bills to be heard was the TCA’s Reasonable Alternatives to Opioids Bill (sponsored by Sen. Bo Watson and Rep. Cameron Sexton) which had already passed with all ayes through the Senate. In the full House Health Committee, the bill passed without opposition and will now go on to the House Calendar and Rules Committee. Our bill addressing Massage Establishments (sponsored by Sen. Kerry Roberts and Rep. Matthew Hill), facing strong opposition from the Massage Licensing Board, was on calendar that afternoon in the House Facilities, Licensure, & Regulations Subcommittee and was voted through to the full Health Committee in another successful vote. This year we provided a special opportunity for a guided tour of the State Capitol. We want to extend a special thank you to Mr. B. L. Rhodes, key legislative staff to Rep. Ron Gant, for donating his time to give our group such an informative and entertaining tour full of interesting highlights and historical facts. 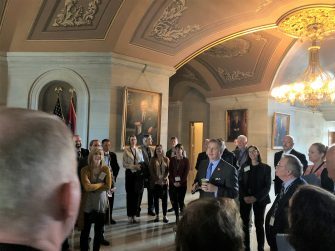 In an impromptu bonus to our Capitol tour, we ran in to Sen. Kerry Roberts, who graciously shared several stories with the group, including how his personal home is connected with Tennessee history. If you participated in Day on the Hill, be sure to return your Legislative Appointment Response Form to the TCA office if you have not already done so. These are important in our advocacy efforts! As the legislative session continues, the TCA will keep members updated via Doctor Privilege. 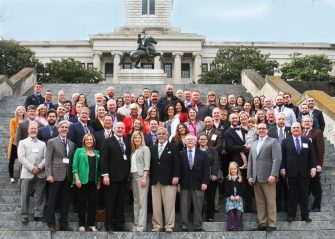 View the full 2019 TCA Day on the Hill photo album here. Why do we need a Day on the Hill? What if No One Was There? The TCA encourages informed and active participation in government, with the aim to ensure that chiropractic physician voices are part of political dialogue on issues impacting the profession. Far too often in the development of public policy, the needs and concerns of those that are affected are overshadowed by statistical data, political speechifying and high-profile jockeying among powerful special interests. Doctors of chiropractic must get involved in the discussions that directly affect you. Without your voice, others will be speaking for you.